"We stand at the threshold of an altogether new art- an art with forms which mean or represent nothing, recall nothing, yet which can stimulate our souls as deeply as only the tones of music have been able to." --August Endell on abstract art, 1898. Representation is a topic in visual arts, music and literature, it concerns the depiction and ethical and political concerns of image construction and narrativity. Another way of reading fictional characters symbolically is to understand each character as a representative of a certain group of people. For example, Bigger Thomas of Native Son by Richard Wright is often seen as representative of young black men in the 1930s, doomed to a life of poverty and exploitation. Dagny Taggart and other characters from Atlas Shrugged by Ayn Rand are seen as representative of American's hard-nosed, hard-working class. Many practitioners of cultural criticism and feminist criticism focus their analysis of characters on cultural stereotypes. In particular, they consider the ways in which authors rely on and/or work against stereotypes when they create their characters. Such critics, for example, would read Native Son in relation to racist stereotypes of African American men as sexually violent (especially against white women). In reading Bigger Thomas' character, one could ask in what ways Richard Wright relied on these stereotypes to create a violent African-American male character and in what ways he fought against it by making that character the protagonist of the novel rather than an anonymous villain. Representation - the production of meaning through language, discourse and image - occupies a central place in current studies on culture. This broad-ranging text offers a comprehensive outline of how visual images, language and discourse work as `systems of representation'. 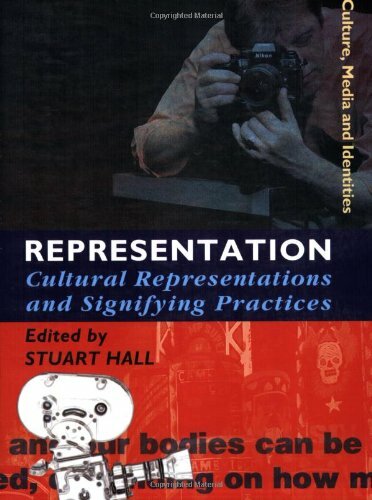 Individual chapters explain a variety of approaches to representation, bringing to bear concepts from semiotic, discursive, psychoanalytic, anthropological, sociological, feminist, art-historical and Foucauldian models of representation. They explore representation as a signifying practice in a rich diversity of social contexts and institutional sites: the use of photography in the construction of national identity and culture; other cultures in ethnographic museums; fantasies of the racialized `Other' in popular media, film and image; the construction of masculine identities in discourses of consumer culture and advertising; and the gendering of narratives in television soap operas.